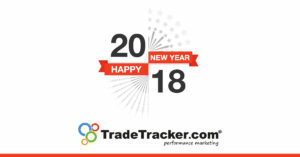 We would like to extend our thanks and best wishes to everyone who has played a part in TradeTracker’s growth over the years and may it continue in 2018 and beyond! It is individuals and companies like yourself who make being in this business such a pleasure all year round. We are proudly humbled by the company we keep and thank everyone for a wonderful year. We hope that our partnership will reach new heights in this forthcoming year!